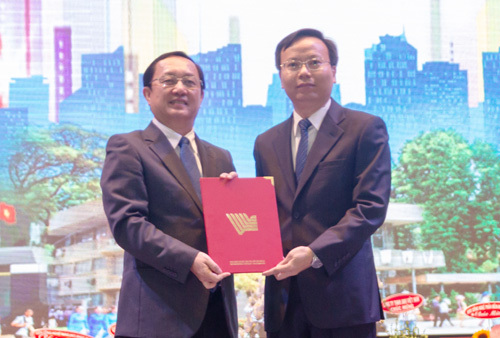 At the ceremony, the President of Viet Nam National University – Ho Chi Minh City (VNU-HCM) Prof. Dr. Huynh Thanh Dat officially handed over the HCMUT’s Rector Designation Decision to Assoc. Prof. Dr. Mai Thanh Phong, a successor of ex-rector Prof. Dr. Vu Dinh Thanh. Born in 1972 in Ha Tinh Province, Assoc. Prof. Dr. Mai Thanh Phong is a Doctoral Degree holder in Chemical Engineering conferred upon by the University of Otto-von-Guericke Magdeburg in Germany. Assoc. Prof. Dr. Mai Thanh Phong has held the following positions of Vice Dean of Faculty of Chemical Engineering (2007 – 2013), Director of Center for Technology Business Incubation (since 2010) and Vice Rector in charge of R&D and External Relation Affairs (since 2014). Assoc. 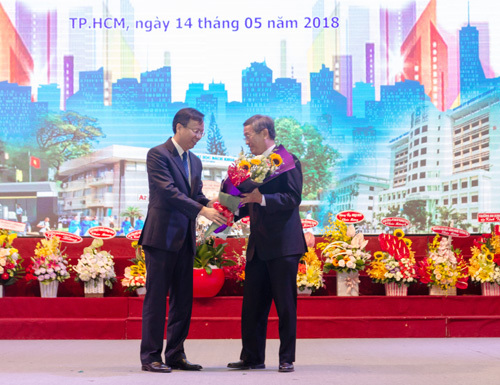 Prof. Dr. expressed his honor and thanks to Ministry of Education and Training, Ho Chi Minh City People’s Committee, VNU-HCM, Rector board, staff and lecturers of HCMUT for their entrustments to designate him as the Rector of the University. Assoc. 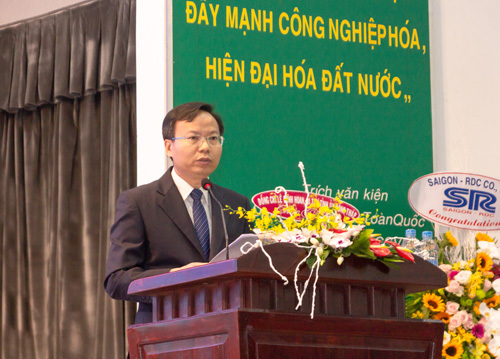 Prof. Dr. Mai Thanh Phong noted to implement the following missions under his rectorship term: autonomy in higher education, human resource development, continuous enhancement of quality in training, research and development, technology transfer, international cooperation and industry linkage. On this occasion, the president VNU-HCM Prof. Dr. Huynh Thanh Dat awarded a medal of People’s Teacher to Ex-Rector Prof. Dr. 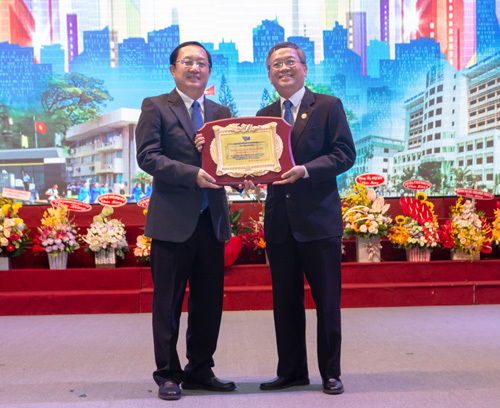 Vu Dinh Thanh as recognition of his significant contribution as the Rector of HCMUT during his Rectorship term. · Continuing the effective implementation of “the development strategies of HCMUT, period of 2016 -2020” with the aim of innovation in operation mechanism toward autonomy in compliance with the accountability. · Enhancing training quality to address the highly qualified human resource needs of recruiters, producing more human resources to southern provinces and regions and other key economic zones. · Enhancing quality in research & development and technology transfer, paying special attentions to doing research integrated in master program curricula; international publications; contribution to communities, specifically including Ho Chi Minh City, South-west, South-east regions and highlands. Ho Chi Minh City University of Technology was established in 1957 as a Technical National Center which was incorporated 4 institutions, namely Public College, College of Electrical Engineering, National School of Engineers, Vietnam School of Maritime. 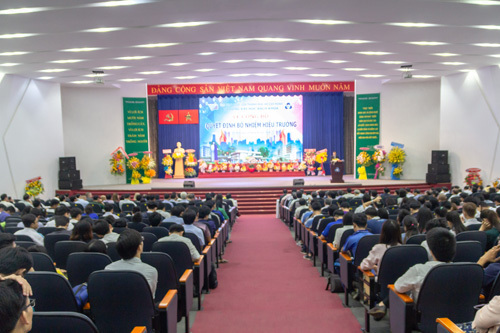 The University became a university member of Viet Nam National University – Ho Chi Minh City (VNU-HCM) as Ho Chi Minh City Polytechnic University in 1995 and then renamed as Ho Chi Minh City University of Technology (HCMUT) 6 years later. Over 60 years of building and development, Ho Chi Minh City University of Technology has gained its popularity in training quality. Notably, 35 full-time undergraduate programs and 39 graduate programs have been developed integrating academic knowledge with soft skills and foreign language competences, also applying advanced international training models like CDIO. 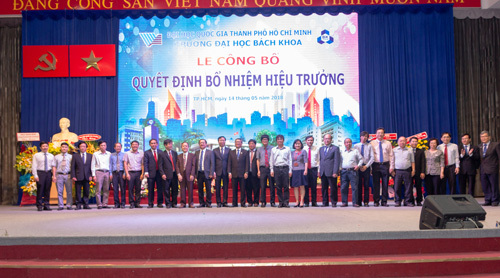 Up till now, Ho Chi Minh City University of Technology, a unique university in Vietnam, has been recognized by the two regionally and internationally well-known accreditation organizations (AUN-QA and HCERES). Also, the University is the first university in Vietnam, 2 programs of which have been recognized by ABET (the USA), 13 programs by AUN-QA (ASEAN), 07 programs by CTI (Europe) and by ISO for higher education management…..